NOV. 16, 2017, 7:30 a.m. to 9:00 a.m.
A Fortune magazine book reviewer writes, “Red Notice does for investing in Russia and the former Soviet Union what Liars Poker did for our understanding of Salomon Brothers ,Wall Street, and the mortgage –backed securities business in the 1980’s. Senator McCain has written that Browder’s “… fight for justice made him an unlikely international human rights leader…” and the biographer of Steve Jobs and Einstein, Walter Isaacson says”…Bill Browder is an amazing moral crusader , and his book is a must-read for anyone who seeks to understand Russia, Putin, or the challenges of doing business in the world today”. Bill Browder grew up in South Chicago with a famous grandfather Earl Browder, the head of the American Communist Party. As a youngster, Browder wandered aimlessly without personal, political and economic direction. Then having an epiphany, he decided to become a capitalist and pursue an undergraduate education at the University of Chicago and an MBA from Stanford. Disappointed with the traditional domestic career approach for graduating finance majors, Browder decided to seek an opportunity in Eastern Europe and then settling in Russia. 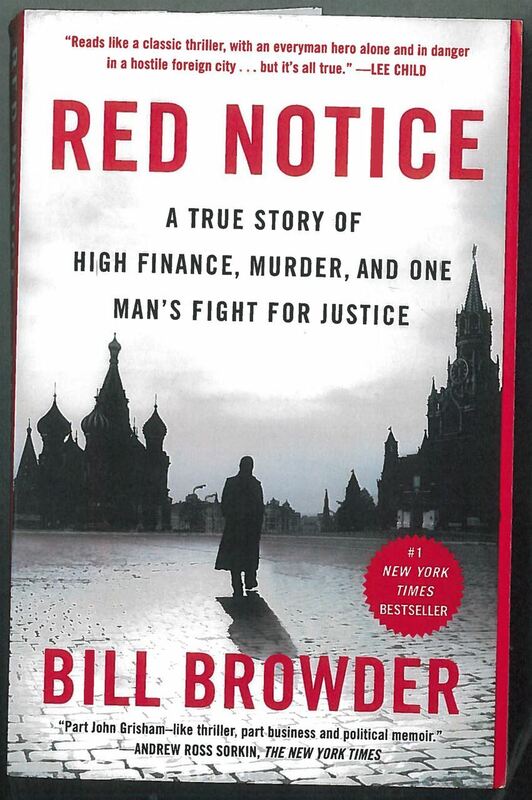 This book is the stuff of novels and films, but what makes the book so amazing is that Browder’s story is true. Red Notice is the PCFR Book Group’s choice for November. We anticipate a lively and intellectually stimulating discussion. Don’t miss this session!